I just posted a review of the fun and fresh Laptop T.O.T.E. bags from Urban Junket (T.O.T.E. = "to observe the earth"). There are two great things about these bags: the amazing colour palette and the very smart functional design - Tracey Dyer, the designer, has fashioned one bag with three ways to carry it: over the shoulder (tote-style), across the body (messenger-style) and on the back (backpack-style). Maybe I'm just feeling a little nostalgic for John Hughes this days - but I have to say that my journey with my review copy of the Urban Junket T.O.T.E. reminded me of the teen romance films of my youth. You know the ones I mean. Those teen movies where the female protaganist is a bit of a tomboy who maybe wears glasses and she's desperately in love with the male protaganist, but he doesn't even see her! But then at the end of the film, he suddenly realizes that the perfect woman was right in front of him the whole time! Well...that's kind of how it was with me and the Urban Junket T.O.T.E. I confess that when I first received the Urban Junket T.O.T.E., it was summer and I thought it was nice. It wasn't until the days started to get a little darker and the leaves turned that I really started to notice it - arrestingly colourful, slick and chic. How had I not seen it before? And how soon could I come up with an excuse to take it out somewhere?? The Urban Junket T.O.T.E. ("Tote" stands for "To Observe the Earth") comes in two sizes, the 15.4" and the 17", which is the one I have. Its glossy exterior is eco-friendly coated canvas made from non-toxic dyes - a definite plus in my book. The glossy material is also water resistant - another plus in rainy Vancouver - although there is a little gap between the zipper and the edge of the bag, so you know - don't toss it in the pool or anything. 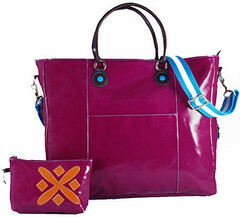 Plus, there is a great video from Tracey showing how to configure the bag in each of its three styles. You can also skip the review and go straight to the Urban Junket T.O.T.E. over at CareerBags.com.